The rotator cuff, namely four tendons around the shoulder, facilitate the movement of the shoulder in all directions. 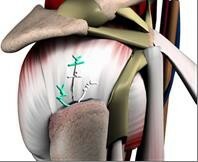 The shoulder tendons are subject to wear and tear at the point at which they are attached. Further irritation may occur due to a lack of space as a result of bone growth at the acromion. The tendons may tear as they gradually wear. The tendon may tear as a result of spontaneous ageing processes, excessive strain, certain sports (such as volleyball), professions (painting) or as a result of an accident (a fall or sudden tug of the arm). Rotator cuff tears cause pain and reduced strength in the affected shoulder, though many degrees are possible with this condition. In some cases the cuff is only partially torn: this causes pain but good mobility and strength is retained. A tear does not heal of its own accord because these zones of the tendon have very little blood supply. The greater the tear, the more movement and strength is lost in the shoulder. In this case it is more difficult to raise the arm frontwards or sideways. If the rotator cuff tears completely it is impossible to move the arm in any direction. Most cuff tears cause a dull, nagging pain in the region of the shoulder and upper arm. There may be a shooting pain when performing certain movements, combined with a skipping feeling. Pain at night is usually very common. It is frequently impossible to sleep on the affected shoulder or the patient is woken up during the night when he or she lies on the shoulder. Everyday activities become more difficult or impossible. A suspected tear in the tendon is based on your account and following a clinical examination. Further investigation using ultrasound and/or imaging will confirm the presence of a tear. There are different types of tears. A decision is made about whether or not to repair the tendon based on your age, activity, the type of tear and the pain. Temporary relief for minor tears, or older tears caused by wear and tear that do not cause much trouble, may be provided by painkillers and anti-inflammatory medication (NSAIDs). Moreover, injections with corticosteroids may help, but if misused can have a more detrimental effect on the quality of the tendon. On the other hand, the torn shoulder tendon will never heal on its own. 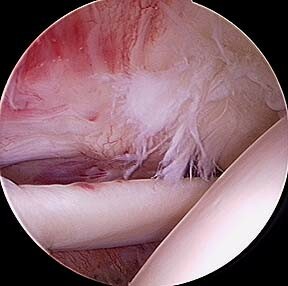 This means that in many cases an operation is recommended to restore the shoulder’s strength. If the tear goes untreated it will worsen over time and could even cause severe osteoarthritis (wear and tear of the joint). In most cases tears in the tendon can be treated surgically. The operation is called arthroscopy or keyhole surgery. The advantage of arthroscopy is that the orthopaedic surgeon can see more of the shoulder joint via a few small incisions, than in a so-called ‘open operation’, which necessitates a much larger incision. The small wounds also heal quicker and leave minimal scars. The operation is less painful and the first few post-operative weeks are much more bearable for the patient. Moreover, the risk of certain complications is also reduced. The anaesthetist administers a local anaesthetic for the operation. This is a temporary local anaesthetic administered to the shoulder via an injection in the neck. It ensures the shoulder is much less painful the first 12-24 hours. As a result the sedation can be lighter. This is followed by a general anaesthetic. You are completely sedated. Arthroscopy is an operation that is performed under a general anaesthetic combined with a local anaesthetic. 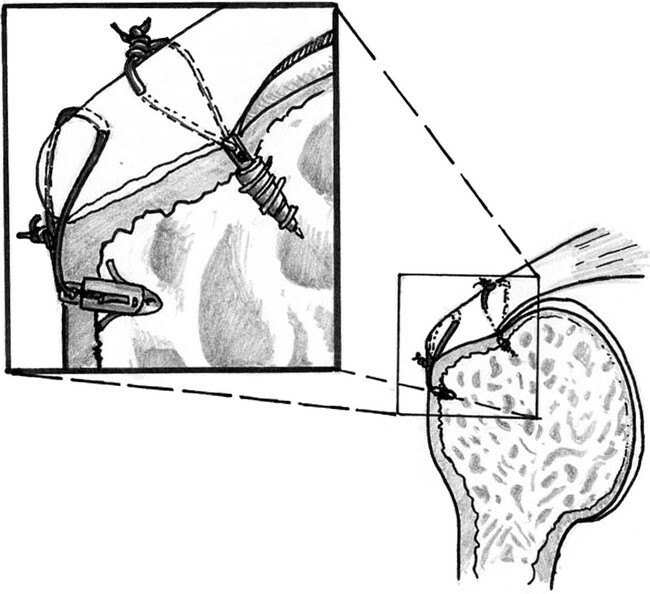 The inside of the shoulder joint is viewed using a camera inserted through a small incision (0.75 cm). The surgeon examines whether there is any damage to the tendons around the shoulder joint and the joint capsule. The orthopaedic surgeon is able to insert all kinds of instruments such as small scissors, examining hooks and lancing devices needed to internally stitch the tendon through the stitch-size incisions. During the procedure the shoulder is rinsed with water, which expands it. This makes it easier for the surgeon to operate and he or she has a broader view. Following a thorough inspection of the shoulder joint, the inflamed bursa is removed. 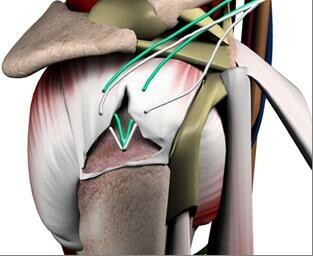 Any loose fragments of tendon are removed. Several anchors are inserted in the end of the bone from which the tendon was torn off, to which threads are attached. The torn tendon is separated from the point at which it is attached so that at the end of the procedure it can be properly attached in the position of its muscular insertion. To do this we use an electrocauter device that allows us to cut away any adhesions and stem any small contusions. The threads of the anchors are used to stitch the tear. This is performed using special stitching instruments through the small incisions. Lastly the underside of the acromion is partially shaved off to create more space for the tendon so that friction no longer occurs. At the end of the operation the wounds are stitched or glued. 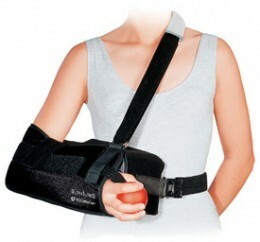 You receive a shoulder sling with an abduction pillow, in which you can rest your arm. Once the tendon has been stitched back on to the bone, nature needs six weeks before the tendon fuses with the bone. It is vital that you do not attempt to raise the arm independently during the first six weeks, if you do the results of the procedure could be completely undone!